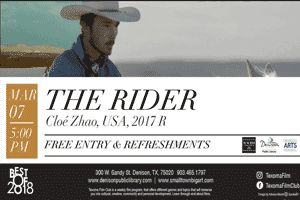 ‘“The Rider,” a marvelous film by Chloé Zhao, tells the story of rodeo horseman Brady Blackburn, who, after suffering a near-fatal head injury after being stepped on by a bucking bronco, must find his place within a world where the phrase “ride or die” takes on real, high-stakes meaning. Blackburn is played by Brady Jandreau, a real-life bronc rider who sustained similar injuries. After Zhao met him while researching another film, she decided to create a movie around him, lightly fictionalizing his story and casting other nonprofessionals — including Brady’s father and sister — in supporting roles. Filmed with widescreen grandeur on the Pine Ridge Reservation in South Dakota, “The Rider” reinvigorates tropes from the western genre of men, horses, honor codes and vast expanses of nature with a refreshing lack of sentimentality, without sacrificing their inherent lyricism and poetry. Taken from: “‘The Rider,’ starring a real rodeo horseman, is a breath of fresh prairie air for westerns”, written by Ann Hornaday, for The Washington Post, April 18, 2018.